With Tekla, your project team can work efficiently and productively on one Tekla project model, so information available to them is up to date and consistent. Tekla Model Sharing enables you to flexibly manage teams, bringing together the right people for project success. The service is accessed directly from Tekla Structures, there is no additional download. Teams using Tekla Model Sharing can work at the same time, on the same model, offline or online and then use the internet to synchronize their Tekla Structures project when needed. As the team can work effectively on one model without being situated in one office, the service allows you to balance the workload across teams and offices according to your resources and requirements. Tekla Model Sharing provides the ability for teams of all sizes to be able to work on all kinds of projects. 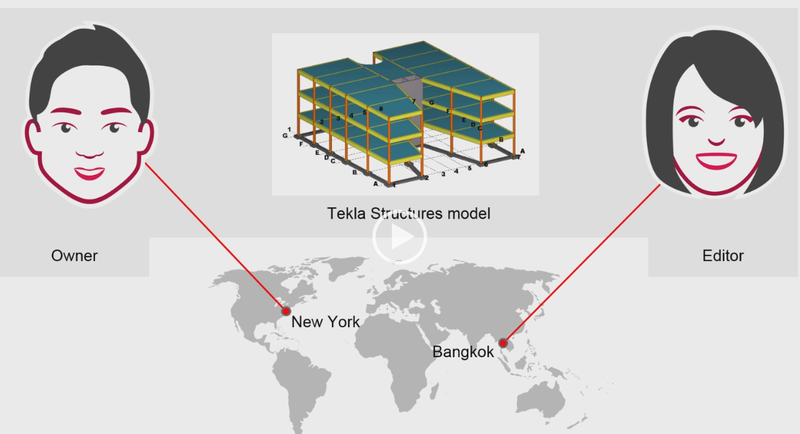 The model data is safely stored locally on each team member's computer and then synchronized with latest changes globally via the Tekla Model Sharing cloud service hosted by Tekla. The data is transferred encrypted and managed according to the highest security protocols. You can trial Tekla Model Sharing for free with an evaluation license valid for 3 months. Please contact your local Tekla reseller for more information. Tekla Model Sharing service is then accessed from the standard File menu within Tekla Structures software. What if you work as a team in an area with very slow internet connections? If you work in a part of the country with very slow internet connections, you have the option of installing the free Tekla Model Sharing cache server to compliment Tekla Model Sharing. When you use the Tekla Model Sharing Cache server, just one team member has to download the large project files over the Internet. Using the Cache, a special optional feature of Tekla Model Sharing, the files are quickly distributed to team members using the internal network. The cache works with downloading files, not uploading.